This review was sponsored by The Sola Company. All views are my own. So you all need to know that this product review started with investigative journalism. So I clicked through and checked them out. Looked interesting enough. So I put it on my “to order a sample list” on Evernote and went on about my business. About a week later, though, fate stepped in. (If you believe in fate.) A rep from the company reached out to me to see if I’d like to try it. Why, sure! But first…what the hell is it? I asked this not only for myself, but because I know you guys are pretty sweetener savvy. I can’t get anything past you guys! And over the past few years many of you have stopped using artificial sweeteners in favor of more natural choices. (I respect that but traditionally I’ve been a Splenda girl myself.) So I was eager to know what’s in it. The rep from the company…let’s call him Bob (because…that actually is his name) was happy to help me understand. But there was one ingredient I had never heard of (more on that in a minute) and he even helped me with that too! So here we are now, together. Exploring the wonderful world of Sola. Shall we dive in? So there are two things to talk about here. The packaging and the look of the product itself. Now I should say that every time I talk about this product I keep wanting to say Solar instead of Sola. I think they know that, which is why the package design was bright and cheery and had sun-like imagery going on. They sent me a gamillionty-seven sample sized containers (about 1.5 cups each), but by the time you read this, they should be very close to releasing their 2 lb. bags. The second thing we need to talk about is the actual look of the product. In a word: wow. So the first thing I did when I got the product was to pop off the lid, dip my finger in there and take a taste. (I’m ghetto like that). And it was the very first thing I noticed – this stuff looks like sugar. Like…Splenda. Ok, so it is much lighter in weight than actual sugar and even though they call it Splenda granular it’s sort of…powdery. So are most other major sweeteners. But Sola is not. It is actually granules. Real granules. That crunch between your teeth and release little bursts of sweetness (more on the flavor in a moment). This was both exciting and displacing to me. Over the course of the past few weeks I’ve tried Sola in a bunch of things and when I bake with it, that granular aspect is cool. But when I put it in stuff like cottage cheese, it’s a little odd. Now granted crunchiness is something I LOVED about sugar. But I haven’t had that particular crunch in 9 years so it was a little bit odd for me, if that makes sense. Anyhoo…let’s move on because I know you want to know what’s in it, how it tastes and what I ended up doing with it. 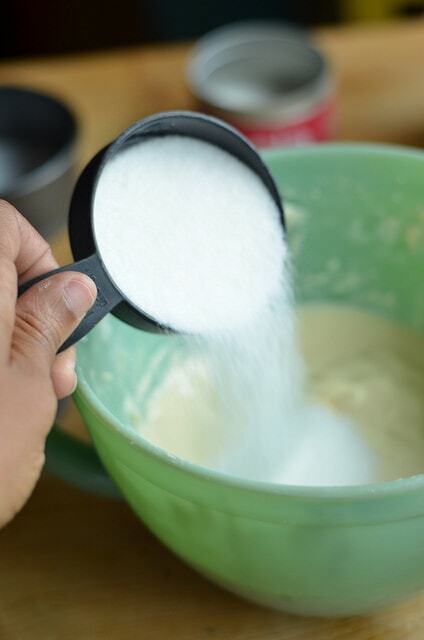 Erythritol: You all should be familiar with this sugar alcohol. But don’t get too scared. Studies show that this sugar alcohol doesn’t have a super negative impact on the human digestive system, which is why it’s used in a lot of stuff. Tagatose: So this one tripped me up. I had never, ever, ever heard of it! After reading a very helpful Wikipedia article, I discovered it’s another type of sugar located in milk (the main sugar we are used to hearing about is lactose). But tagatose has a much lower glycemic impact (meaning it doesn’t raise your glucose level the way sucrose does) and still manages to be sweet. Maltitol: Also a sugar alcohol that is extracted from starch (corn, as best I can tell). From my reading, I believe it is also the source of an interesting side effect I talk about below. Monkfruit Extract: Monkfruit is one of the newer sources of sweetener on the block. Alone, it is sold in many supermarkets already. Stevia Leaf Extract: So we all know what that is, right? Natural Flavors: Ah…the most irksome ingredient the Food and Drug Administration says companies don’t have to explain! I don’t fault Sola for this. Sometimes it’s easier to just say natural flavors. But still…what is that??? So here’s how the macros shake out. For a teaspoon it has: 0 calories, 0 fat, 4 total carbs, 1g sugar (that’s that tagatose), 3g sugar alcohols and 0g protein. 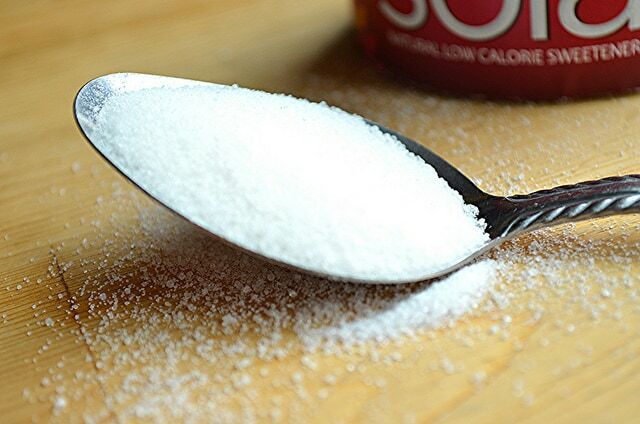 Since neither the tagatose nor the sugar alcohols have a negative glycemic effect (they don’t shoot up your blood sugar), by law Sola is allowed to subtract them from the carb count, meaning that a teaspoon of Sola has 0 net grams of carbs. You all still with me? I’m glad I did the finger dip because it gave me a chance to taste it without any extraneous flavors getting in the way. So what did it taste like? Well, first let’s admit that I am biased because I’ve been eating no-calorie sweeteners for nearly a decade, but…it tasted like sugar to me! But I didn’t trust my opinion so I then proceeded to take the container around to every member of my family, make them dip their fingers in it and asked what it tasted like. (So now the Sola container is probably hella germy!) They all said it tasted like sugar. But there was one interesting thing. When it hits the tongue there’s a slight cooling sensation, not unlike mint. But without a minty flavor. That’s the best way I can describe it. It wasn’t unpleasant at all, but it did happen so I thought I’d mention it. Apparently that’s due to the maltitol. Interesting. So I was all types of excited at this point, but Sola had one more test to pass. Does it really bake like sugar? For those of you who are new to Bariatric Foodie, you should know this. I. Love. Cheesecake. 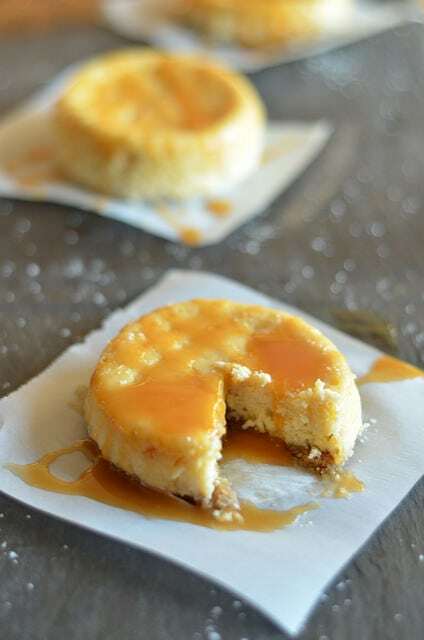 So when I was deciding what to bake with Sola, naturally, I wanted to do a cheesecake! 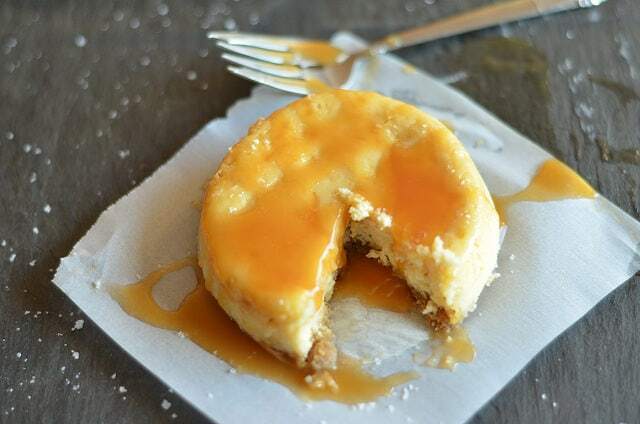 Salted Caramel Mini-Protein Cheesecakes, to be exact! But save that for later. Right now, let’s not lose focus! The important thing here is…how did the cheesecake turn out? Yes it did bake just like sugar. I did a cheesecake do-over and even tested some of my no-flour cookie recipes with it and all of them came out perfect. No, I didn’t have any adverse reaction to Sola. None at all! And, yes, I am very sugar-sensitive so if there was a reaction to be had, I would have had it. But I did just fine with it. No, the cooling/quasi-minty sensation did not carry over into the baked products. At least not as far as I could tell. So overall, I was impressed! I love, love, love to bake but doing so with sugar subs just frustrates me. The texture is always a bit different, it doesn’t brown right. Just a bunch of problems…none of which I had with Sola. So that’s exciting to me! Ok so here’s where I’m a bit impaired by this product being so new. I actually don’t know how much a bag of it will cost. I can tell you their Starter Kit, which comes with 1.4 lb. sampler bag and a recipe book, retails for $18.99 on Amazon. I’m hoping the actual product will be far less, but it’s not available yet, so I don’t know! But here’s what I do know. 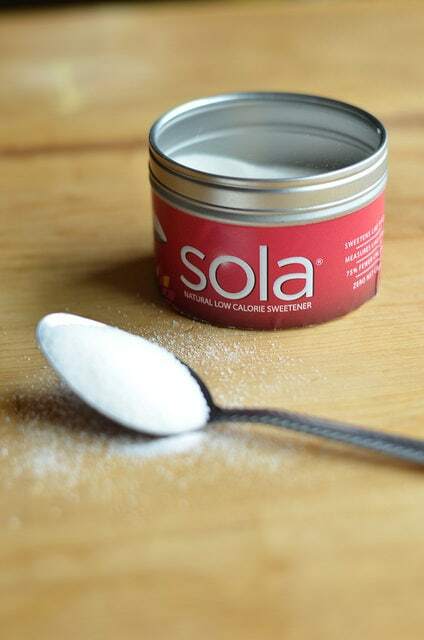 Sola has offered to give the Foodie Nation a heads up when the full product is released, along with announcements of giveaways and discounts! Go here to get on the list to receive those notifications. So…this one is a hard because I don’t have the final price on the product. I will say though that I’ve been using it since early January and I’ve been able to enjoy all sorts of low-carb baked treats. It truly does bake like sugar so there isn’t some of the wonkiness that comes from baking even with Splenda (and which, in the past, drove me to use Splenda Brown Sugar Blend to achieve better results). Anyhoo…here’s where I netted out with the whole thing. I love this for my baking. It’s still a little weird for my yogurt and cottage cheese and stuff. I may go to hell or have my left arm fall off or something, but I do like my Splenda for that stuff, just because I’ve become acclimated to the texture of it in those things. But for baking? Oh I am definitely using this stuff! And my family likes it for their everyday consumption. When I put this out, they didn’t touch the sugar. So that’s encouraging! Again, you want to get on their notification list for when they release the full product. I’ calling that my official verdict. Because this stuff is worth checking out! I wanna check out Sola! Oh…and by the way…I have a friend named Nichelle who runs a company called “My Bariatric Box,” which is a subscription service where you can get different WLS-friendly products every month. I do believe Sola is going to make an appearance in a box very soon, so you might want to check that out as a way to try it (and lots of other things), too!